G.P. Putnam's Sons Books for Young Readers, 9781524739942, 160pp. 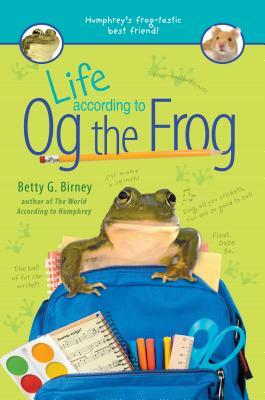 The adventures in Humphrey's Room 26 are hopping back into the spotlight, from the perspective of Og the Frog! When Og the Frog first comes to Room 26, he doesn't know what to think. He misses his friends from the pond, there are all kinds of strange noises, and the water is his tank just might be too clean (you know, a little muck never hurt anyone). But the furry, squeaky fellow living next to him is endlessly entertaining, the kids sure are friendly, and--BING, BANG, BOING!--they put big fat crickets right into his tank. All of this gives Og lots of ideas for one of his favorite passtimes--making up poems and songs. But he gets stumped when talk turns to sending him back to the pond. Will he have to say good-bye to Tabitha whose whole life just changed like his? Or Mandy who just started seeing the bright side of things with his help? And Humphrey, who he's finally beginning to figure out? Og's frog's-eye view of the world is curious, sympathetic, and poetic, and the perfect companion to The World According to Humphrey.